I've noticed on the days I come home from the market with meat for Bekkie Boo Boo, and I give her — for example — some fresh stew meat right from the package, without the added supplements — she gobbles it up, instantly, versus when I normally prepare her food with the supplements mixed in, which she ends up eating — more slowly — over a couple of hours. Have you found other pet owners having trouble getting their pets to eat raw with all the supplements added in? Sure it's possible that some pets will not like the supplements. You can test her to see which supplements she likes and doesn't like. Day 1. Feed her the food as you normally do but with no supplements on it. Observe how she eats, how fast she eats, etc. Day 2. Feed her with only 1 supplement of your choice. I would start with the EggShellent Calcium. Observe. Day 3. Remove the EggShellent Calcium and use a different supplement. Observe. Day 4. Rotate another supplement in. Observe. Keep doing this until you have rotated through all the supplements. You will then see if 1 or more supplements in particular turn her off . However, what I suspect is that the reason why Bekkie Boo Boo is so excited when you come home is because she can smell the meat. There is a lot of meat smells on the package. Dogs and cats eat based on their sense of smell. So if she can smell the meat, she gets excited. The same will probably happen too as the meat you feed gets warmer. This is why I like to add hot water to the meat, in some situations, to help volatize the odor. If I can't add water, then I like to have the meat at room temperature so the odors begin to move more and then the dog or cat can smell it. Anyway, I suspect it's the sense of the smell that is making her eat fast... the smells just excite her... get her very excited and thus eating fast. The same meat that excites her when you get home may not excite her the next day or two once it has been in the freezer or the fridge. 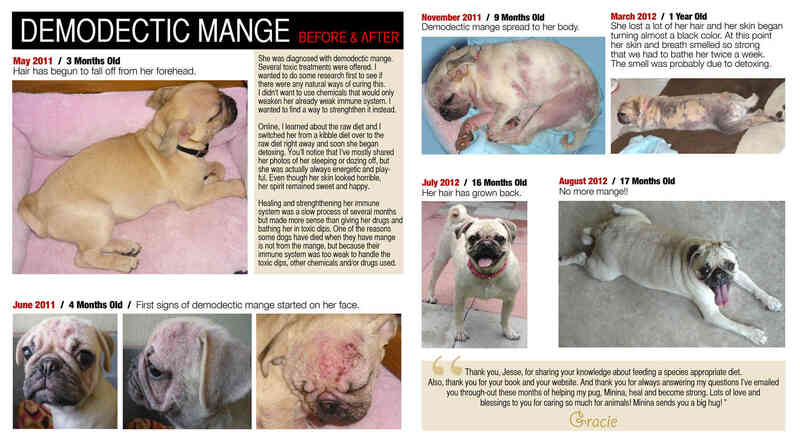 What Can Be Done To Help Severe Demodectic Mange? Did you know that... Dr. Pottenger found that during his 10 year cat study with over 900 cats that the cats fed raw meat over their life span showed resistance to infections, to fleas, and to various other parasites, and showed no signs of allergies. They are friendly and predictable in their behavior patterns. When thrown or dropped as much as 6 feet to test co-ordination, they always landed on their feet and came back for more play. Now you know! source: Pottenger’s Cats: A Study In Nutrition by Francis M. Pottenger, M.D.